I currently reside in Reno, Nevada with my fiancée Maria and our two dogs Mosa and Brody. On May 8, 2010 I suffered an injury resulting in a broken neck in a local sporting event in Reno. This left me as a C-5 incomplete quadriplegic. Since the onset of my injury my focus has been primarily on physical therapy and getting as much return back as possible. For the level of my injury I am told that I am having a great recovery thus far and will continue to do so in the future. I have been getting significant return through my trunk and lower extremities which is showing great potential into the future for walking. The majority of my therapy has taken place in Reno, NV. I decided to stay in Reno, Nevada and do my inpatient therapy here because it's where my support structure was/is. I then transitioned right into outpatient therapy through the hospital as well. My family and friends decided to start fundraising money for me and the fight for the cure. This allowed me to put a whole new team together around me to rehab full-time: a physical therapist, an aqua therapist, a personal trainer, a massage therapist, and some other alternative therapies(including acupuncture). The therapies and treatments are not cheap as anyone can imagine, not to mention that Reno has limited resources. Our latest race for the cure landed us in Portland, Oregon at Adapt training, where I was able to regain use of my hip flexors. I was extremely lucky to be given the opportunity to go up there but as with everything the trip was too short. Throughout this journey and my therapy Maria, my family and friends have been more than helpful in researching ways to get help for the very fight we have been fighting. They came across the Dreams of Recovery Foundation. We have been very blessed in that we are receiving an FES bike from Cindy Donald and the Dreams of Recovery Foundation. This will allow me to continue my rehab, get stronger, regain more function, and continue progressing toward my goal of independence which functional walking is a part of. Throughout my recovery I've been trying to stay as active as possible, which includes getting back to some of the activities I used to enjoy as an abled body. 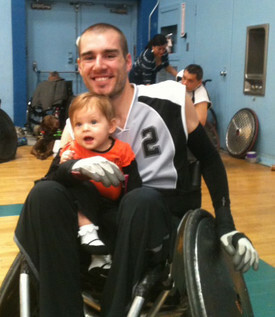 I immediately started playing wheelchair rugby, a.k.a. "Murderball." I found many benefits to the sport of wheelchair rugby: first it just started being about more activity, then I found support in the people around me, and I felt a state of normalcy. Rugby continues to be a big part of my life and will continue to be in the future. I had to get back on the snow and try skiing again after being such an avid snowboarder in the past. This is one of the most fun activities I've done since being injured yet one of the most physically demanding. In October of 2011, I got back into the outdoors and went hunting for the first time since being injured, and was able to harvest a mule deer. This was truly one of the proudest moments I've ever had in my life, and most surprising. As I wasn't even expecting to get anything! I just wanted to get back in the outdoors. I have gotten back in the saddle, literally. Horseback riding has always been one of my favorite hobbies and will continue to be in the future now that I have went again as well. Life cannot just be all fun and games. I spend time mentoring new spinal cord injuries and their families down at the local hospital and rehab facility. Also, volunteer and help coach a youth wheelchair rugby program. Young children with spinal cord injuries and diseases also need motivation to keep moving and looking forward to the future. This is just a little bit of my story, I welcome all of you to join me on Facebook at "Chris Chapman Power for Recovery." "Live hard. Love hard. Play hard."